“The Muslims defeated the Islamists” in Egypt. To my mind, these five words by Walid Abi-Mershed in his column today for Saudi Asharq Alawsat explain the army’s removal of Mohamed Morsi, Egypt’s first Islamist president, after millions of people protested over his leadership. Dr. Mohamed ElBaradei went to al-Ittihadiya Palace to meet with Egyptian President Mohamed Morsi on the latter’s invitation. The meeting was one-on-one, except that the visitor sensed the presence of others. He saw behind the president the silhouettes of Mohamed Badie, Supreme Guide of the Muslim Brotherhood, and his second-in-command Khairat el-Shater. Such shadows raise suspicions. The visitor worried about the president resorting to the supreme guide, not the constitution. Hamdeen Sabahi went to al-Ittihadiya Palace. The shadows’ insistence on attending the meeting reminded him of his conversation with presidential candidate Morsi during the countdown to the runoffs. Hamdeen had won some five million votes in the first round and opted out of the presidential race. Morsi was hoping to woo those voters to secure victory over Ahmed Shafiq in the runoff. Morsi could not answer and chose instead to offer Hamdeen the post of vice president. Amr Moussa went to al-Ittihadiya Palace and met with Morsi and the two shadows. Since he emerged from the meeting and monitored the president’s performance, he did not hide his disquiet about the future of Egypt, the native land of Taha Hussein and Naguib Mahfouz that has always been a beacon of hope for its people. Moussa got into such a sweat about Egypt’s spirit. That was in the lead-up to June 30, which all three men consider to be a landmark day. They believed early presidential elections were de rigueur to save the country from Morsi’s regime. Clearly, they meant to save it from the big shadow cast on the regime – the shadow of the supreme guide. Standards and the code of ethics require professional journalists not to fall for the opposition. So we had to make our way to the headquarters of the Freedom and Justice Party, political arm of the Muslim Brotherhood. I asked the party vice chairman Dr. Essam el-Erian if he ever-expected President Hosni Mubarak to fall and Egypt to choose a president from the Muslim Brotherhood. Erian did not seem worried about June 30. His self-assurance made him say he not only expected Morsi to complete his mandate but could also win a second term. Erian sounded confident and relaxed and on completion of our conversation he invited my colleague Mohamed Salah and I to the office of party chairman Saad el-Katatni. The later was equally laid-back. The “January 2011 revolution” took by surprise both the Brotherhood’s supreme guide and the armed forces’ top dog at the time, Field Marshal Hussein Tantawi. The two men reacted with aplomb. Voters then eagerly opted to cast off the shadows of Mubarak and his generals. They ended up with Morsi’s regime and the supreme guide’s shadow. Morsi failed to dispel the impression that “the supreme guide’s bureau is the president’s president.” His mistakes piled up and the media showed him no mercy. Fear of “Brotherhood-ization” by millions of Egyptians turned “June 30” into a broad uprising against the president and the shadow lurking in the palace. In January 2011, Tantawi felt the army had to connect with the public squares. In June 2013, Gen. Abdel Fattah al-Sisi felt the army had to reconcile with them and sponsor them. The result was a full-blown intifada and a quasi-coup. The “Brothers” refused to come to terms with the outcome. They refused to reflect on the reasons that drove millions to public squares to jeer them. They refused to recognize the implications of the millions of signatures on the Tamarrud petition. 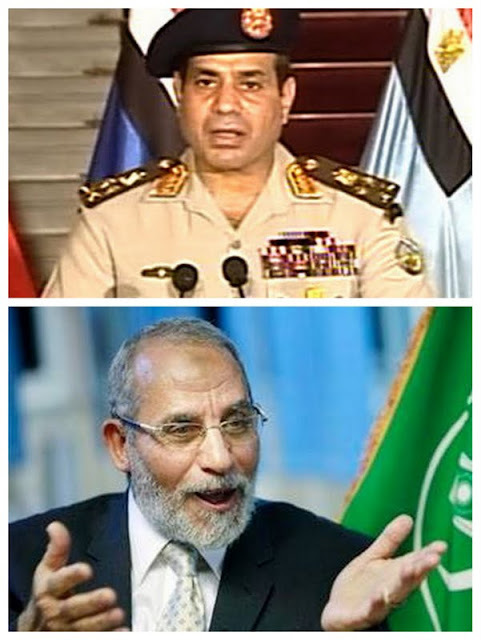 The “Brothers” preferred to aim at Gen. Sisi’s shadow to portray the Brotherhood as the victim and the scapegoat. When the head of the High Constitutional Court Adly Mansour was sworn in as interim president, they elected to see Gen. Sisi’s silhouette behind him. Yesterday’s sight of two Egypts facing off in the shadows of the supreme guide and army general was traumatic. The “Brothers” ventured to take the supreme guide’s shadow into the palace. Removal of an elected president in a quasi-revolution and quasi-coup is a gamble as well. There is no solution other than to quickly exit this tunnel and sail into an Egypt in the shadows of a constitution compatible with its spirit and an elected president unbound in his palace by the silhouettes of a supreme guide and an army general.